GCA Altium has advised The Dunamis Group Ltd as it becomes part of Fulcrum Utility Services Ltd, to create one of the UK’s leading gas and electrical infrastructure services groups. This transaction marks GCA Altium's 15th in the Industrials space in the last 12 months. 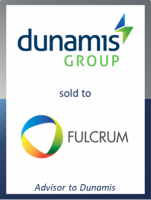 Fulcrum, which is listed on London’s Alternative Investment Market (AIM), has entered into a conditional agreement to acquire Dunamis, one of the UK’s leading independent electrical connections providers. Fulcrum is a multi-utility infrastructure and services provider to the UK’s residential, commercial and industrial markets. The acquisition will significantly expand Fulcrum’s capabilities and specialist knowledge in the electrical infrastructure services sector.